Individual microwave apple crisps are a dessert that can be prepared in just five minutes. With only 200 calories per serving, this is one treat you don't have to feel guilty about! In medium bowl, toss apple slices and butter. Add brown sugar, flour and 1/4 teaspoon apple pie spice. Toss to coat evenly. Spray two 4- to 6-oz microwavable ramekins with cooking spray. Divide apples between ramekins. Microwave ramekins uncovered on High 1 minute 30 seconds to 2 minutes or until apples are softened. 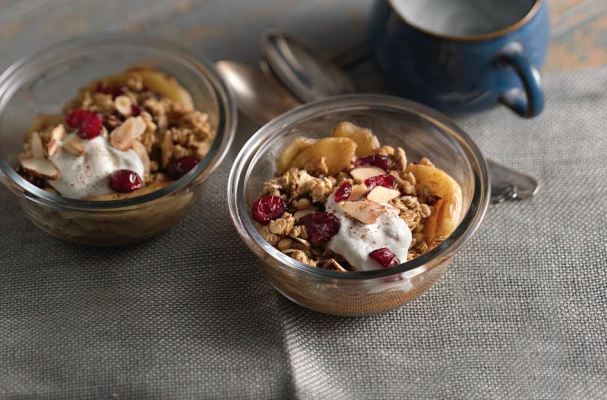 Top each with 1/4 cup of the granola. Top with dollop of yogurt and additional apple pie spice. Serve immediately. Editorial disclosure: Foodista received no payment for this post.